The lawyers at Borowiec & Borowiec P.C. in Sierra Vista are here to help you with your Personal Injury matter, DUI, Family Law issues, Criminal matter or Estate Planning-Contact us today! The Firm has grown to become one of Southeastern Arizona’s preeminent law firms. We are also an AV rated law firm by Martindale-Hubbell, the oldest peer-review rating service in the legal profession. We concentrate our practice on representing the people. We do not represent insurance companies or large corporations against the little guy. The Firm has three members and employs paralegals and legal staff so that each case gets the utmost preparation and personal attention our clients and their families deserve. Joel P. Borowiec is one of the founding members of the firm. He started the law firm in 1997 with his brother, Bill. Joel is a seasoned trial lawyer with over twenty four years of civil jury trial experience. He grew up in Bisbee and graduated from the University of Arizona with a Bachelor of Arts in 1982. He graduated from Hamline University School of Law in Saint Paul, Minnesota in 1985. Hamline has always placed a strong emphasis on trial skills and routinely places in the top rankings under US News and World Reports for its programs. After graduation Joel worked as in-house counsel for American Family Insurance in Milwaukee defending against injury claims. The desire to seek justice for the individual, however, drove Joel to return home and start the firm with his brother. Joel is actively involved in the community and dedicates time to local and Tucson children’s choir groups. He is also a 2011 graduate of the Trial Lawyers College, founded by Gerry Spence, which is a month long program dedicated to providing trial lawyers with enhanced communication and trial skills. William M. Borowiec was one of the founding members of the firm. Bill passed away in 2004. His quick wit and kind heart are missed everyday by those who knew him. Anne M. Borowiec joined the family practice in 1999. Anne is experienced and trained in a broad spectrum of child and family issues. Prior to attending California Western School of Law, in San Diego, Anne graduated from the University of Arizona with a bachelor of science in Child Development and Family Relations. She worked with Child and Family Resources in Tucson from 1992 to 1997. There, she was the Coordinator for the Child Care Resource and Referral Program and provided in-home visitation and support services for families at risk of child abuse through the Choices for Families Program. While in law school, she worked in an inter-disciplinary child abuse and neglect program comprised of social workers, psychiatrists and law students. She was an Honors Legal Writing Instructor, a member of Phi Alpha Delta Law Fraternity and the secretary of the Public Interest Law Foundation. Anne is an active member of our community and serves on the board of directors for the University South Foundation, Inc. at the University of Arizona. Matthew W. Borowiec joined the firm in 2000 after retiring from the Cochise County Superior Court bench. Matt practiced law with the firm of Gentry, McNulty, Toci & Borowiec (and predecessor and successor firms) in Bisbee, Arizona from 1962 to 1978. He served as a Superior Court Judge from 1979 to 2000. For 16 of those years he was the presiding judge. On many occasions he has sat as a judge on the Arizona Court of Appeals. Upon retirement from the bench he was awarded Arizona Supreme Court’s Distinguished Service Award for Outstanding Achievement in Improving Public Trust and Confidence in Arizona’s court system. Our reputation earns us new clients. Our performance, integrity and personal service keeps those clients. The Borowiec & Borowiec, P.C. website is regulated by the Arizona Rules of Professional Conduct. All information contained on this website is provided for informational purposes only and should not be construed as legal advice on any subject matter. 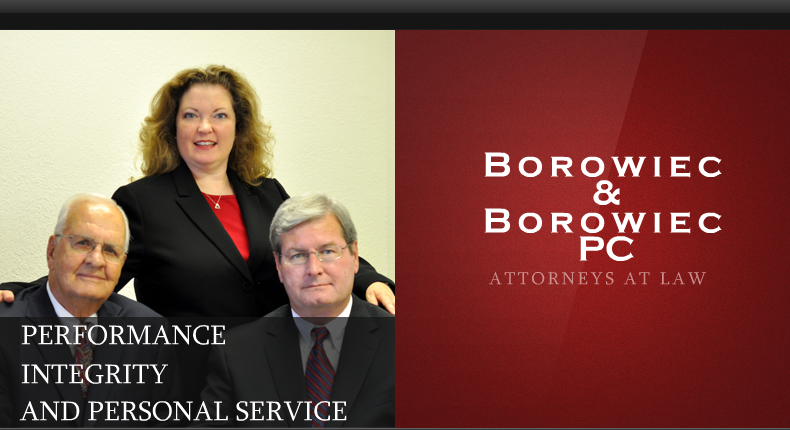 Borowiec & Borowiec, P.C., provides legal advice and other services only to persons with whom we have established a formal attorney-client relationship. Any communication with Borowiec & Borowiec, P.C. by e-mail or through this site does not constitute, nor create, an attorney-client relationship between this firm and the senders or recipients. Further, any information sent to Borowiec & Borowiec, P.C., by internet email or through this web site is not secure and is done on a non-confidential basis. © 2016 Borowiec & Borowiec, PC. Powered by WordPress and Legalpro.